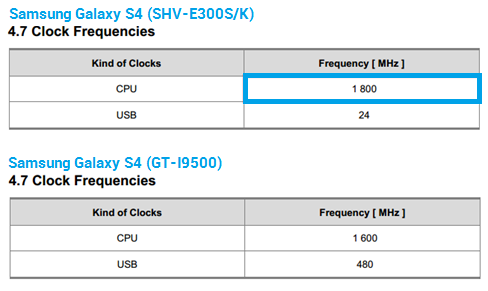 The Samsung Galaxy S4’s Korean variant (SHV-E300S/K) will support an Exynos 5 Octa CPU clocked at 1.8GHz. The device has just passed through FCC certification in the United States of America and the documents on the FCC’s website reveal this information. According to the FCC documents, the Korean version of the Galaxy S4 will have an Exynos 5 Octa CPU with a clockspeed of 1800MHz (1.8GHz) whereas the Global Variant of the Galaxy S4 (GT-I9500) is clocked at 1600MHz (1.6GHz), this makes the Korean variant 200MHz faster. The documents also reveal that the Korean Galaxy S4 supports multi-band LTE (Band 3,5,1,7,17) too. The device is scheduled to be made available between a time frame of late April to early May. Samsung we are claiming not option to choose Octa processor for many countries, because we like your high tech best 😛 and want to have chance to decide and buy by ourselves 🙂 you understand that sure. Not long ago, I read here(sammobile) that all the octa-core would be 1.8Ghz: was a wrong notice?? Version tested i9500 in vietnam is 1.8GHz. i want to use Exynos 5 with clock speed 1.8…. why Always korean version is better than other countries??? I am officially confused with Samsung this year. Most sites saying that Exynos is better with battery so i am gonna get the Exynos one. I don’t really care about the LTE because i live in Greece and LTE support is limited here. But if there is a chance in 2 months to have an LTE version of Exynos i can wait cause SIII is an awesome phone. Or the Exynos that already comes has LTE?